Any cataloguers out there will know that there has recently been a transition to a new cataloguing standard - RDA (Resource, Description and Access). 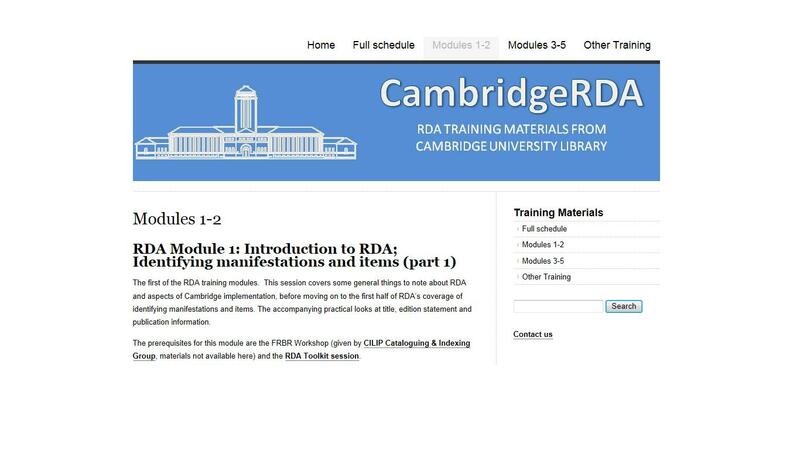 I work at Cambridge University Library which has been using RDA since it's introduction at the beginning of April. This has been an interesting time for us and although it's been hard work I've enjoyed learning something new. 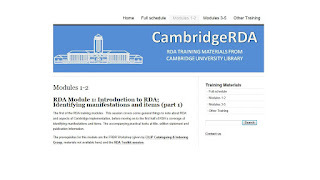 Before Cambridge began using RDA, cataloguers had to undertake some intensive training, including the theoretical background (FRBR), RDA basics and hands-on practical sessions. This training has recently been made available as a creative commons licensed resource on the CambridgeRDA site (which I'm happy to say I had a small hand in creating). Resources on the site include recorded Powerpoint presentations with audio and practical exercises. We hope that it will be useful to people who are currently putting together training programmes for their own staff or those that just want to know a little more about RDA. CILIP Cataloguing and Indexing Group have also put together a list of other available RDA training that people might find useful. This can be found here. I hope that these resources are useful to people, and if people know of any more then please leave me a comment. I think that there are a lot of really useful materials and discussions available out there about RDA and hopefully the cooperative nature of cataloguers will mean that we can make the transition as smooth as possible!